Gq-protein-coupled receptors (GqPCRs) are widely distributed in the CNS and play fundamental roles in a variety of neuronal processes. Their activation results in phosphatidylinositol 4,5-bisphosphate (PIP2) hydrolysis and Ca2+ release from intracellular stores via the phospholipase C (PLC)–inositol 1,4,5-trisphosphate (IP3) signaling pathway. Because early GqPCR signaling events occur at the plasma membrane of neurons, they might be influenced by changes in membrane potential. In this study, we use combined patch-clamp and imaging methods to investigate whether membrane potential changes can modulate GqPCR signaling in neurons. Our results demonstrate that GqPCR signaling in the human neuronal cell line SH-SY5Y and in rat cerebellar granule neurons is directly sensitive to changes in membrane potential, even in the absence of extracellular Ca2+. Depolarization has a bidirectional effect on GqPCR signaling, potentiating thapsigargin-sensitive Ca2+ responses to muscarinic receptor activation but attenuating those mediated by bradykinin receptors. 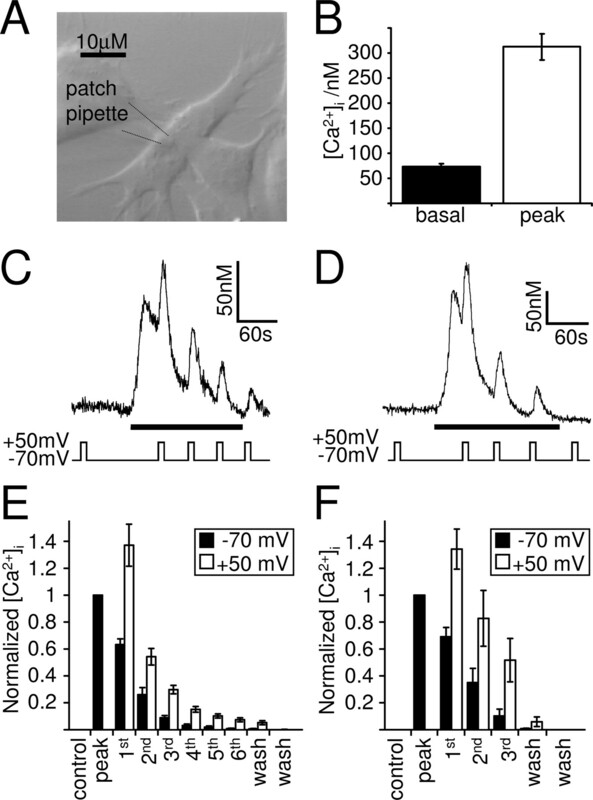 The depolarization-evoked potentiation of the muscarinic signaling is graded, bipolar, non-inactivating, and with no apparent upper limit, ruling out traditional voltage-gated ion channels as the primary voltage sensors. Flash photolysis of caged IP3/GPIP2 (glycerophosphoryl-myo-inositol 4,5-bisphosphate) places the voltage sensor before the level of the Ca2+ store, and measurements using the fluorescent bioprobe eGFP–PHPLCδ (enhanced green fluorescent protein–pleckstrin homology domain–PLCδ) directly demonstrate that voltage affects muscarinic signaling at the level of the IP3 production pathway. The sensitivity of GqPCR IP3 signaling in neurons to voltage itself may represent a fundamental mechanism by which ionotropic signals can shape metabotropic receptor activity in neurons and influence processes such as synaptic plasticity in which the detection of coincident signals is crucial. G-protein-coupled receptors (GPCRs) convert a wide variety of extracellular signals into intracellular messages by binding to and activating Gq/11-, Gs-, Gi/o-, or G12/13-proteins (Neves et al., 2002). Stimulation of receptors coupled to Gq/11-proteins results in activation of phospholipase C (PLC). This leads to hydrolysis of phosphatidylinositol 4,5-bisphosphate (PIP2) and generation of diacylglycerol and inositol 1,4,5-trisphosphate (IP3), resulting in activation of protein kinase C (PKC) and Ca2+ release from intracellular stores, respectively (Berridge, 1993). GqPCRs are widely expressed in the brain and implicated in a variety of neuronal processes, such as synaptic plasticity, regulation of gene expression, and neuronal excitability (Berridge, 1998; Augustine et al., 2003). Although a considerable amount is known about the effect GPCR signaling can have on membrane excitability, the converse, how the membrane potential affects GPCR signaling, has hardly been examined. Interestingly, a synergy between neuronal electrical activity and GqPCR-evoked IP3 and Ca2+ signaling has been demonstrated in a number of systems, including hippocampal neurons in situ (Nakamura et al., 1999, 2000, 2002) and in vitro (Nash et al., 2004; Young et al., 2005), neocortical neurons in situ (Larkum et al., 2003), and cerebellar Purkinje cells in situ (Okubo et al., 2001, 2004). Depolarization was suggested to affect GqPCR signaling indirectly, by evoking Ca2+ influx across the plasma membrane through ion channels. This can (1) promote store filling and thus influence the magnitude of the subsequent response to GqPCR activation (Irving and Collingridge, 1998; Rae et al., 2000), (2) stimulate Ca2+ release from intracellular stores by shifting the sensitivity of the IP3 receptor to IP3 (Berridge, 1998; Nakamura et al., 1999), and (3) stimulate the IP3 signaling cascade by positive modulation of receptor-stimulated PLCβ (Eberhard and Holz, 1988; Hashimotodani et al., 2005). However, because GqPCRs and some of their effectors are located in the plasma membrane of cells with dynamic membrane potentials (e.g., neurons), changes in membrane potential may also influence signaling directly. Indeed, in some non-neuronal cells, GqPCR signaling appears to be sensitive to voltage independently of Ca2+ influx. For example, voltage exerts a graded, bipolar effect on the muscarinic receptor-evoked Ca2+ release in guinea pig coronary artery smooth muscle cells (Ganitkevich and Isenberg, 1993) and on the purinergic P2Y receptor-evoked Ca2+ release in rat megakaryocytes (Mahaut-Smith et al., 1999; Mason et al., 2000; Mason and Mahaut-Smith, 2001; Martinez-Pinna et al., 2004, 2005). The aim of this study was to investigate whether GqPCR-evoked IP3 and Ca2+ signaling in neurons can be directly modulated by changes in membrane potential. Using combined patch-clamp and imaging methods, our data demonstrate that depolarization per se potentiates muscarinic signaling at the level of the IP3 production pathway. The sensitivity of GqPCR signaling to voltage itself may represent a fundamental mechanism by which ionotropic signals can shape metabotropic receptor activity in neurons and influence processes such as synaptic plasticity in which coincidence detection of signals is crucial. To prepare primary cerebellar granule cell cultures, Lister Hooded rats (postnatal days 5–7) were decapitated, the cerebellar hemispheres were discarded, and the cerebellar vermis was diced and incubated at 37°C for 15 min in trypsin solution [PBS containing 0.25 mg/ml trypsin, 1.5 mg/ml bovine serum albumin (BSA) fraction V, 7 mm glucose, and 0.75 mm MgSO4]. The trypsin digestion was stopped by addition of trypsin inhibitor solution (PBS containing 0.4 mg/ml trypsin inhibitor from soybean, 3 mg/ml BSA fraction V, 14 mm glucose, 7.5 mm MgSO4, and 40 U of DNase 1). The digested tissue was centrifuged at 250 × g for 3 min, and the pellet was resuspended in disaggregation buffer (containing PBS, 0.4 mg/ml trypsin inhibitor from soybean, 3 mg/ml BSA fraction V, 14 mm glucose, 7.5 mm MgSO4, and 120 U of DNase 1) and triturated 10–12 times using a fire-polished Pasteur pipette. Larger tissue clumps were allowed to settle for 1–2 min, and the remaining cells in suspension were transferred to a sterile tube and centrifuged at 250 × g for 3 min. The cell pellet was then resuspended in serum-free minimal essential medium (MEM), and the cells were counted and centrifuged at 250 × g for 2 min before DNA plasmid transfection (see below). The cells were then plated on poly-d-lysine-coated coverslips in MEM supplemented with 10% fetal calf serum, 2 mm l-glutamine, 100 U/ml penicillin, 100 μg/ml streptomycin, 25 mm KCl, and 33 mm glucose. After 24 h, three-quarters of the media was exchanged with media containing 10 μm cytosine arabinoside, and, 2 d later, half of the media was exchanged again. The cultured cerebellar granule cells were used for experiments at 4–7 d in vitro. SH-SY5Y human neuroblastoma cells were grown in MEM supplemented with 10% fetal calf serum, 2 mm l-glutamine, 100 U/ml penicillin, and 100 μg/ml streptomycin. Human embryonic kidney 293 cells stably expressing the cloned human muscarinic m3 receptor (Tovey and Willars, 2004) (HEK–m3) were grown in MEM α medium supplemented with 10% fetal calf serum, 100 U/ml penicillin, 100 μg/ml streptomycin, and fungizone. Chinese hamster ovary cells stably expressing the cloned human m3 receptor (CHO–m3) were grown in MEM α medium supplemented with 10% newborn calf serum, 100 U/ml penicillin, 100 μg/ml streptomycin, and fungizone. For experiments, these cells were plated onto 13 mm glass coverslips and used within 1–3 d. All cells were kept at 37°C in humidified air containing 5% CO2. Before recordings, the cells were usually perfused with a solution containing the following (in mm): 134 NaCl, 4.7 KCl, 1.2 MgCl2, 1.3 CaCl2, 4.2 NaHCO3, 1.2 KH2PO4, 10 HEPES, and 11.7 glucose. The pH was adjusted to 7.4 with NaOH and the osmolarity to ∼315 mOsm with sucrose. All recordings were performed in solution lacking Ca2+, and the cells were perfused for at least 8 min with Ca2+-free solution before recording started. For experiments using sodium-free extracellular solution, NaHCO3 was replaced by an equimolar concentration of KHCO3, NaCl was replaced by N-methyl-d-glutamine (NMDG) chloride, and the pH was adjusted to 7.4 with HCl. The standard intracellular solution contained the following (in mm): 140 KCl, 2 MgCl2 10 HEPES, 0.1 EGTA, 2 Mg-ATP, and 0.05 Na2-GTP. The osmolarity was ∼300 mOsm, and the pH was adjusted to 7.3 with KOH. For experiments using potassium-free intracellular solution, KCl was replaced with NMDG-Cl and the pH was adjusted to 7.3 with HCl. All experiments were performed at physiological temperature (35–37°C). Fura-2 and fluo-4 (pentapotassium salts) were obtained from Invitrogen (Paisley, UK); 1-(2-nitro-phenyl)ethyl caged-IP3 (NPE–IP3), NPE caged-glycerophosphoryl-myo-inositol 4,5-bisphosphate (NPE–GPIP2), forskolin, 3-isobutyl-1-methylxanthine (IBMX), and thapsigargin were from Calbiochem (Nottingham, UK); PBS and MEM were from Invitrogen; and bradykinin, oxotremorine-M, ryanodine, caffeine, pertussis toxin (PTX), nifedipine, and all other chemicals were from Sigma (Poole, UK). Whole-cell or amphotericin-B perforated voltage-clamp recordings were made from cells using thick-walled glass pipettes (GC150F-7.5; Clark Electromedical, Reading, UK) with either an Axopatch 200B amplifier (Molecular Devices, Palo City, CA), low-pass filtered at 5 kHz (eight-pole Bessel filter), and sampled at 20 kHz using a 1320 Digidata and pClamp 8.2 software (Molecular Devices) or an EPC-10 amplifier using PatchMaster software (HEKA Elektronik, Lambrecht/Pfalz, Germany). The open tip resistance of the patch pipettes used in whole-cell and perforated-cell experiments was 4–6 and 8–12 MΩ, respectively, and the whole-cell and perforated-cell access resistance was usually 10–15 and 30–40 MΩ, respectively, and compensated for by >70%. Unless indicated otherwise, the membrane potential was clamped at −70 mV. The KD of fura-2 in intracellular patch solution was determined using a calibration kit from Invitrogen. Rmin and Rmax are the ratios, and F380nmmin and F380nmmax are the background-subtracted fluorescence intensities at 0 (minimum) and saturating (maximum; 39 μm) free Ca2+, respectively, as measured in intracellular patch solution using the Invitrogen calibration kit. In some experiments, 100 μm NPE–IP3 or 200 μm NPE–GPIP2 [the slowly metabolized, less potent analog of IP3 (Bird et al., 1992)] was included in the whole-cell patch pipette. To photolyze the caged compounds, the cell was exposed to 360 nm light for 100 ms. In these experiments, fura-2 could not be used as Ca2+ indicator, because the fura-2 excitation light (350/380 nm) photolyzes the caged compounds. Instead, fluo-4 (50 μm) was used as Ca2+ indicator during these experiments. Fluo-4 was excited at 475 nm (10 ms light exposure per frame), a wavelength that does not interfere with the NPE cage, and emitted light was separated by a 505 nm dichroic mirror, filtered with a 520 nm long-pass emission filter, and sampled at 500 ms intervals. Control experiments omitting NPE–IP3/GPIP2 from the pipette showed that the 360 nm light flash did not interfere with the fluo-4 fluorescence signal. The fluo-4 fluorescence signal was background subtracted, and graphs were presented as F/Fo ratios, where F is the background-subtracted fluorescence intensity, and Fo is the background-subtracted fluorescence intensity at the start of the recording. Plasmid transfection and enhanced green fluorescent protein–pleckstrin homology domain–PLCδ1 imaging. Cerebellar granule neurons and SH-SY5Y cells were transfected with enhanced green fluorescent protein (eGFP)–pleckstrin homology domain–PLCδ1 (PHPLCδ1) plasmid DNA (Stauffer et al., 1998) by electroporation (Amaxa, Cologne, Germany), using the Rat Neuron Nucleofector kit and program G-13, according to the instructions of the manufacturer, and the cells were used for experiments 2–7 d after the electroporation. Alternatively, SH-SY5Y cells were transfected with 0.5 μg/ml eGFP–PHPLCδ1 plasmid DNA using 1.5 μl/ml Lipofectamine2000 (Invitrogen), according to the instructions of the manufacturer, the transfection medium was replaced after 4 h, and cultures were used for experiments 1 and 2 d later. eGFP was excited at 488 nm (100 ms light exposure per frame) with a Cairn Optoscan monochromator (xenon lamp based; Cairn Research, Faversham, UK), emitted light was separated by a 505 nm dichroic mirror and filtered with a 520 nm long-pass emission filter, and the fluorescent signals were acquired every 500 ms with a Cascade 512B cooled CCD camera (Photometrics, Tucson, AZ). The eGFP fluorescence signal was background subtracted, and graphs were presented as F/Fo ratios. For illustration purposes only, the images in Figures 9Aa–Ad and 10, Ab and Ac, were deconvolved using a no-neighbor algorithm implemented in MetaMorph (Universal Imaging). All data are given as mean ± SEM, and statistical analysis was performed using paired or unpaired two-tailed t tests as appropriate and regarded as significant if p < 0.05. Cultured SH-SY5Y cells (Fig. 1A), a human neuronal cell line closely resembling sympathetic ganglion cells, endogenously express Gq-coupled muscarinic acetylcholine receptors, mainly of the M3 subtype (Lambert et al., 1989). Activation of these receptors with a muscarinic agonist, such as oxotremorine-M, leads, via the activation of PLC and the generation of IP3, to Ca2+ release from intracellular stores. In Ca2+-free solution, to prevent Ca2+ influx and record purely store Ca2+ release, this was measured in whole-cell patch-clamped SH-SY5Y cells as a transient Ca2+ increase from a basal Ca2+ concentration of 73 ± 6 to 313 ± 26 nm at −70 mV (Fig. 1B) (n = 39; 10 μm oxotremorine-M) and 76 ± 12 to 232 ± 13 nm at −70 mV (n = 5; 1 μm oxotremorine-M). Because the experiments were performed in the absence of extracellular Ca2+, intracellular Ca2+ stores will gradually run down without the possibility of refilling. In accordance, the magnitude of the Ca2+ transient varied between cells, depending greatly on the amount of releasable Ca2+ left in the stores. Depolarization during the oxotremorine-M-evoked Ca2+ transient potentiated the Ca2+ signal for the duration of the depolarization, an effect that could be repeated several times during the muscarinic response (Fig. 1C–F) and that we term “depolarization-evoked potentiation” (DEP). Depolarization of whole-cell patch-clamped SH-SY5Y cells in Ca2+-free solution in the absence of muscarinic agonist (control) did not affect the intracellular Ca2+ concentration (n = 130), confirming that there is indeed no voltage-dependent Ca2+ influx under these conditions. Muscarinic Ca2+ signaling in the human neuronal cell line SH-SY5Y is potentiated by depolarization. A, DIC image of cultured SH-SY5Y cells. These cells were whole-cell patch clamped and intracellular Ca2+ imaged using the Ca2+ indicator fura-2 applied to the cytoplasm via the patch pipette. B, Mean ± SEM of the basal intracellular Ca2+ levels and the muscarinic receptor-mediated Ca2+ transient evoked by 10 μm oxotremorine-M in whole-cell patch-clamped SH-SY5Y cells (n = 39). C, D, Ca2+ responses of whole-cell patch-clamped SH-SY5Y cells to a maximal (10 μm; C) and submaximal (1 μm; D) concentration of oxotremorine-M (black bar). Depolarization (10 s from −70 to +50 mV) in the presence of oxotremorine-M potentiated the muscarinic Ca2+ response. E, F, Mean ± SEM of the intracellular Ca2+ concentration rise normalized in each cell to the peak response to 10 μm (E) and 1 μm (F) oxotremorine-M at −70 mV (black bars). Control, Normalized Ca2+ rise during the depolarization before oxotremorine-M application; Peak, normalized maximum Ca2+ increase evoked by muscarinic receptor stimulation at −70 mV; first to sixth, normalized Ca2+ rises at the time of the first to the sixth depolarization in the presence of oxotremorine-M; wash, normalized Ca2+ rises after oxotremorine-M application. Depolarization (10 s to +50 mV; white bars) significantly potentiated the Ca2+ responses to 10 μm (E; n = 38; p < 0.01) and 1 μm (F; n = 5; p < 0.01) oxotremorine-M in all cells tested. In addition to Gq-coupled muscarinic receptors, SH-SY5Y cells also endogenously express Gq-coupled bradykinin (B2) receptors (Willars and Nahorski, 1995). Activation of these receptors also leads to Ca2+ release from intracellular stores via the PLC–IP3 pathway [1 μm bradykinin, n = 6 (Fig. 2A); 0.1 μm bradykinin, n = 10 (Fig. 2B)]. In contrast to the muscarinic Ca2+ response, depolarization did not potentiate the bradykinin-evoked Ca2+ transient. In 6 of 16 cells (3 of 6 and 3 of 10 for 1 and 0.1 μm bradykinin, respectively), depolarization did not appear to influence the bradykinin-evoked Ca2+ transient at all, whereas in the remaining 10 of 16 cells (3 of 6 and 7 of 10 for 1 and 0.1 μm bradykinin, respectively), the bradykinin-evoked Ca2+ signal decreased for the duration of the depolarization. Interestingly, depolarization still potentiated the Ca2+ signal evoked by activation of muscarinic receptors in the same cell (Fig. 2C). These data show that depolarization can bidirectionally affect Gq-coupled receptor signaling, enhancing the muscarinic receptor-evoked Ca2+ signal but attenuating the bradykinin-evoked Ca2+ signal, even in the same cell. Bidirectional effect of depolarization on muscarinic and bradykinin receptor-mediated Ca2+ signaling in SH-SY5Y. A, B, Ca2+ responses of whole-cell patch-clamped SH-SY5Y cells to a maximal (1 μm; A) and submaximal (0.1 μm; B) concentration of bradykinin (black bar). Depolarization (10 s to +50 mV) attenuated the bradykinin-evoked Ca2+ response. C, Specimen trace of an SH-SY5Y cell in which the muscarinic Ca2+ signal (10 μm oxotremorine-M; first black bar) was potentiated (black arrows) by depolarization, whereas the bradykinin receptor-mediated Ca2+ signal was attenuated (white arrows) by depolarization (0.1 μm bradykinin; second black bar). The black dotted lines show the predicted Ca2+ signal if the cell was not depolarized. Being a neuronal cell line, SH-SY5Y cells are relatively complex, expressing a variety of typically neuronal proteins (see Discussion). To investigate whether voltage affects the M3 receptor-evoked muscarinic Ca2+ signal even in the absence of these neuronal components, we examined the effect of voltage on the muscarinic Ca2+ signal in two non-neuronal cell lines, stably expressing recombinant M3 receptors: CHO–m3 and HEK–m3 cells. A CHO–m3 clone was chosen (Fig. 3A) that expresses the M3 receptor at a comparable level with that present in SH-SY5Y cells (200–250 fmol/mg). Activation of muscarinic M3 receptors in whole-cell patch-clamped CHO–m3 cells in the absence of extracellular Ca2+ evoked transient Ca2+ increases that were not potentiated by depolarization (Fig. 3C) (10 μm oxotremorine-M, n = 5; 0.6 μm oxotremorine-M, n = 6). To check that this was not simply a characteristic of CHO–m3 cell Ca2+ signaling, we repeated the experiments in another non-neuronal cell background. 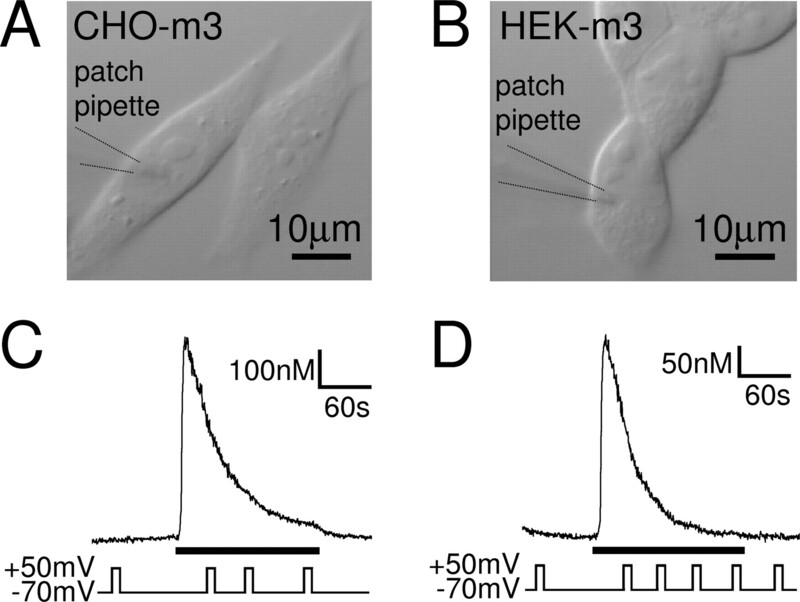 Again, the muscarinic Ca2+ signal in response to 0.6 μm oxotremorine-M in whole-cell patch-clamped HEK–m3 cells (Fig. 3B) in the absence of extracellular Ca2+ was not affected by depolarization (Fig. 3D) (n = 6). These results show that the muscarinic Ca2+ signaling pathway is not necessarily affected by depolarization and suggest that the M3 receptor itself is not sensitive to voltage. We thus investigated the DEP of the muscarinic Ca2+ signaling pathway in the neuronal SH-SY5Y cell line further to narrow down the site of voltage sensitivity. The muscarinic Ca2+ signal in CHO and HEK cells expressing recombinant M3 receptors is not affected by voltage. DIC images of cultured CHO–m3 (A) and HEK–m3 (B) cells, two cell lines stably expressing recombinant M3 receptors. C, D, Ca2+ responses of whole-cell patch-clamped CHO–m3 (C) and HEK–m3 (D) cells to 10 and 0.6 μm oxotremorine-M (black bars), respectively. Depolarization (10 s to +50 mV) did not affect the Ca2+ signal in the two expression systems. In addition to Gq-protein-coupled receptors, SH-SY5Y cells also express Gs and Gi/o-protein-coupled receptors (Klinz et al., 1987), which are positively and negatively coupled to adenylyl cyclase (AC), respectively. The different G-protein signaling pathways can interact, and cross talk between Gi/o- and Gq- as well as Gs- and Gq-coupled receptor signaling has been shown in a variety of systems (Werry et al., 2003). In SH-SY5Y cells, activation of some pertussis toxin-sensitive Gi/o-coupled receptors enhances the Ca2+ signal produced by activation of Gq-coupled M3 muscarinic receptors (Connor and Henderson, 1996). Given that Gi/o-protein-coupled receptor signaling can be sensitive to voltage (Ben-Chaim et al., 2003), we investigated whether the DEP of the muscarinic Ca2+ signal was via an effect of voltage on Gi/o-protein signaling, which could crosstalk to enhance the muscarinic Ca2+ signal. However, even when Gi/o-protein signaling was blocked by incubation with pertussis toxin (20 h, 100 ng/ml), the muscarinic Ca2+ signal evoked by oxotremorine-M was still potentiated by depolarization (Fig. 4A,B) (1 μm, n = 5; 10 μm, n = 5), indicating that the DEP of the muscarinic Ca2+ signal does not involve the Gi/o pathway. The DEP of the muscarinic Ca2+ signal is not mediated by Gi/o-proteins or the Gs–AC pathway and does not involve L-type Ca2+ channels or ryanodine receptors. Ca2+ responses of whole-cell patch-clamped SH-SY5Y cells to 1 μm (A) or 10 μm (C) oxotremorine-M (black bars). The cells were incubated for 20 h in 100 ng/ml PTX to inhibit Gi/o-protein signaling (A) or exposed to 100 μm ryanodine for >6 min and during the course of the experiment to block ryanodine receptors (C). Even in these conditions, depolarization potentiated the muscarinic Ca2+ signal. B, Mean ± SEM of the intracellular Ca2+ rise evoked by the first depolarization in 1 μm (1 oxo-M) and 10 μm (10 oxo-M) oxotremorine-M in untreated (ctrl.) cells and in cells treated with PTX or forskolin/IBMX (fors.). In all conditions, depolarization potentiated the oxotremorine-M-evoked Ca2+ signal significantly (1 μm oxotremorine-M: control, n = 5, p < 0.01; PTX, n = 5, p < 0.01; 10 μm oxotremorine-M: control, n = 38, p < 0.01; PTX, n = 5, p = 0.03; forskolin/IBMX, n = 3, p = 0.03). The depolarization-evoked Ca2+ increase is not significantly different in control, PTX-, and forskolin/IBMX-treated cells (p > 0.05). 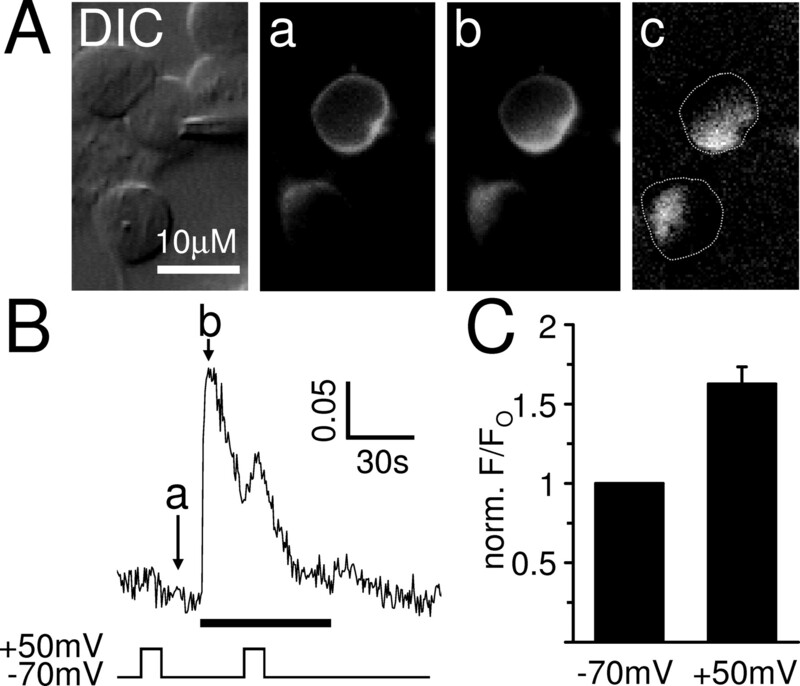 D, Mean ± SEM of the intracellular Ca2+ rise evoked by the first depolarization in 10 μm oxotremorine-M in untreated cells (control), in cells treated with 10 μm nifedipine (nifedip. ), and in cells exposed to 100 μm ryanodine (ryanod.). In all conditions, depolarization potentiated the muscarinic Ca2+ signal significantly (control, n = 38, p < 0.01; nifedipine, n = 6, p < 0.01; ryanodine, n = 7, p < 0.01). The depolarization-evoked muscarinic Ca2+ increase is not significantly different in control and in the presence of nifedipine or ryanodine (p > 0.05). In some systems, the Gs–AC–cAMP pathway interacts with the Gq–PLC–IP3 pathway to enhance Ca2+ signaling (Werry et al., 2003). One possible mechanism may be the phosphorylation and sensitization of IP3 receptors to IP3 by cAMP-dependent protein kinase (Wojcikiewicz and Luo, 1998). Because the activity of AC may be influenced, directly or indirectly, by the membrane potential (Reddy et al., 1995; Cooper et al., 1998), we investigated whether the DEP of the muscarinic Ca2+ signal was via an effect of voltage on the Gs–AC–cAMP signaling pathway, which could crosstalk to enhance the muscarinic Ca2+ signal. We exposed the cells for >10 min before and throughout the recording to 50 μm forskolin, to maximally activate AC and thus saturate cAMP production, and 100 μm IBMX, to inhibit phosphodiesterase and thus limit cAMP breakdown. Under these conditions, the Gs–AC–cAMP signaling pathway should be maximally activated and insensitive to any additional stimulation by, for example, voltage. However, even in these conditions, depolarization still potentiated the oxotremorine-M-evoked muscarinic Ca2+ signal (Fig. 4B) (10 μm oxotremorine-M, n = 3), indicating that the DEP of the muscarinic Ca2+ signal is not via an effect of voltage on the Gs–AC–cAMP pathway. Depolarization-evoked Ca2+ release from intracellular stores has been demonstrated in a variety of systems. In skeletal muscle, depolarization of the sarcolemma is sensed by L-type Ca2+ channels, and the resulting conformational change is mechanically transferred by physical coupling to ryanodine receptors, leading to Ca2+ release from intracellular stores. A similar mechanism has also been proposed for terminals of hypothalamic neurons, in which plasmalemmal depolarization increases the open probability of intracellular ryanodine receptors, causing increased Ca2+ release from intracellular stores (De Crescenzo et al., 2004). In addition, depolarization sensed by L-type Ca2+ channels has also been shown to increase IP3 mass in skeletal muscle (Araya et al., 2003) and activate G-proteins and the PLC–IP3–Ca2+ pathway to induce Ca2+-induced Ca2+ release via ryanodine receptors in vascular myocytes (del Valle-Rodriguez et al., 2003). These effects of depolarization could be blocked by L-type Ca2+ channel inhibitors. Because SH-SY5Y cells express functional voltage-gated L-type Ca2+ channels (Forsythe et al., 1992) as well as ryanodine receptors (Mackrill et al., 1997), we investigated whether the DEP of the muscarinic Ca2+ signal could be produced by a mechanism similar to the one in skeletal muscle, hypothalamic nerve terminals, or vascular myocytes. Although none of these were shown to require GPCR activation, constitutive activity may still have taken place. However, the Ca2+ response to 10 μm oxotremorine-M in the presence of the L-type Ca2+ channel blocker nifedipine (>6 min preincubation in 10 μm nifedipine; n = 6) or in the presence of 100 μm ryanodine (>6 min preincubation with ryanodine; n = 7) (Fig. 4C), a concentration that blocks ryanodine receptors (Verkhratsky, 2005), was still potentiated by depolarization (Fig. 4D). This indicates that neither functional L-type Ca2+ channels nor ryanodine receptors are required for the DEP of the muscarinic Ca2+ signal in SH-SY5Y cells and rules out a conformational coupling model, such as occurs in skeletal muscle cells. Apart from L-type Ca2+ channels, SH-SY5Y cells possess a variety of other voltage-gated ion channels. These include voltage-gated sodium and potassium channels (Forsythe et al., 1992), currents through which can be recorded in whole-cell patch-clamped SH-SY5Y cells (see Fig. 6A–C). Theoretically, either of these channels could serve as voltage sensor and transfer the information of plasma membrane voltage changes to the muscarinic Ca2+ signaling pathway. To get an indication of the type of voltage sensor involved, we characterized the voltage dependence of the muscarinic Ca2+ signal. In whole-cell patch-clamped SH-SY5Y cells, 10 μm oxotremorine-M evoked Ca2+ transients at −70 mV in Ca2+-free solution, which were potentiated by depolarization to +50 mV. This equates to a voltage step (ΔVstep) of 120 mV amplitude. Subsequent voltage steps to +50 mV, given ∼1 min apart during the oxotremorine-M application, evoked Ca2+ increases with reduced amplitude (Fig. 1C), which may be attributable to gradual emptying of the stores. The amount of potentiation varied between cells, making it difficult to assess Ca2+ increases in response to different size voltage steps. To overcome variability between cells, we depolarized each cell from −70 to +50 mV (ΔVstep of 120 mV) before and after depolarizing it from −70 to x mV (ΔVstep of y mV). We then normalized the Ca2+ increase evoked by depolarization to x mV (i.e., the second depolarization) to the average of the two Ca2+ increases evoked by depolarization to +50 mV (i.e., the first and third depolarizations). Depolarizations of different amplitude caused different amounts of potentiation, with larger voltage steps evoking greater potentiations of the Ca2+ signal (Fig. 5A–C). No clear activation threshold could be observed, and depolarization to +80 mV (Fig. 5A,C) evoked even greater potentiation than depolarization to +50 mV (Fig. 1C, 5C). This suggests that the voltage sensor is not simply a voltage-gated ion channel, which should show a clear activation threshold and would be expected to be fully activated at +50 mV. Instead, the voltage dependence of the muscarinic Ca2+ signal was gradual, with no apparent upper limit. The DEP of the muscarinic Ca2+ signal is graded with no apparent upper limit, bipolar and non-inactivating. Ca2+ responses of whole-cell patch-clamped SH-SY5Y cells to 10 μm oxotremorine-M (black bars). A–C, The cells were depolarized for 10 s from −70 to +50 mV (ΔVstep of 120 mV) before and after depolarizing them from −70 mV to a certain step potential, e.g., from −70 to +80 mV (A; ΔVstep of 150 mV) or from −70 to 0 mV (B; ΔVstep of 70 mV). C, Mean ± SEM of the Ca2+ increases evoked by depolarization to a certain step potential (i.e., the second depolarization) normalized to the average of the two Ca2+ increases evoked by depolarization to +50 mV (i.e., the first and third depolarizations) in each cell. Larger voltage steps evoked greater potentiations of the Ca2+ signal, with no apparent upper limit (−100 mV, n = 7; −40 mV, n = 6; 0 mV, n = 9; +50 mV, n = 21; +80 mV, n = 6). D–F, The cells were depolarized for 10 s from −70 to +20 mV (ΔVstep of 90 mV) before and after depolarizing them slowly over ∼15 s to 0 mV and then for 10 s from 0 to +90 mV (D; ΔVstep of 90 mV) or from 0 to −90 mV (E; ΔVstep of −90 mV). F, Mean ± SEM of the Ca2+ increases evoked by depolarization or hyperpolarization from a holding potential of 0 to +90 mV or −90 mV (i.e., the second depolarization) normalized to the average of the two Ca2+ increases evoked by depolarization from −70 to +20 mV (i.e., the first and third depolarizations) in each cell. To investigate whether the voltage sensor of the muscarinic Ca2+ signal could be inactivated by depolarization, we performed similar experiments as described above. However, after the initial first depolarization from −70 mV by a certain ΔVstep, we now depolarized the cells slowly over ∼15 s to a new holding potential before the second depolarization by the same ΔVstep, this time from the new holding potential. Interestingly, the slow depolarization to the new holding potential of −25 mV (n = 5) or 0 mV (n = 17) gradually increased the muscarinic Ca2+ signal (Fig. 5D,E). This confirms, as already suggested above, that the voltage sensor does not have a clear activation threshold. It also shows that the voltage sensor is not inactivated by slow depolarization, unlike most voltage-gated ion channels. Moreover, depolarization from the new holding potential of −25 mV (to +95 mV, i.e., ΔVstep of 120 mV; n = 5) or 0 mV (to +120 mV, i.e., ΔVstep of 120 mV, n = 5; or to +90 mV, i.e., ΔVstep of 90 mV, n = 7) still potentiated the muscarinic Ca2+ signal (Fig. 5D,F), indicating that the voltage sensor of the muscarinic Ca2+ signaling pathway is not inactivated at these potentials. Furthermore, hyperpolarization from a holding potential of 0 to −90 mV (ΔVstep of −90 mV) decreased the muscarinic Ca2+ signal (Fig. 5E,F) (n = 5), revealing a bipolar effect of voltage on the muscarinic signaling pathway. These data unveil a gradual (with no apparent upper limit), non-inactivating, bipolar voltage dependence of the muscarinic Ca2+ signal in SH-SY5Y cells, excluding traditional voltage-gated ion channels as primary voltage sensors. This profile of voltage dependency is similar to the one observed on P2Y receptor signaling in megakaryocytes (Martinez-Pinna et al., 2004). 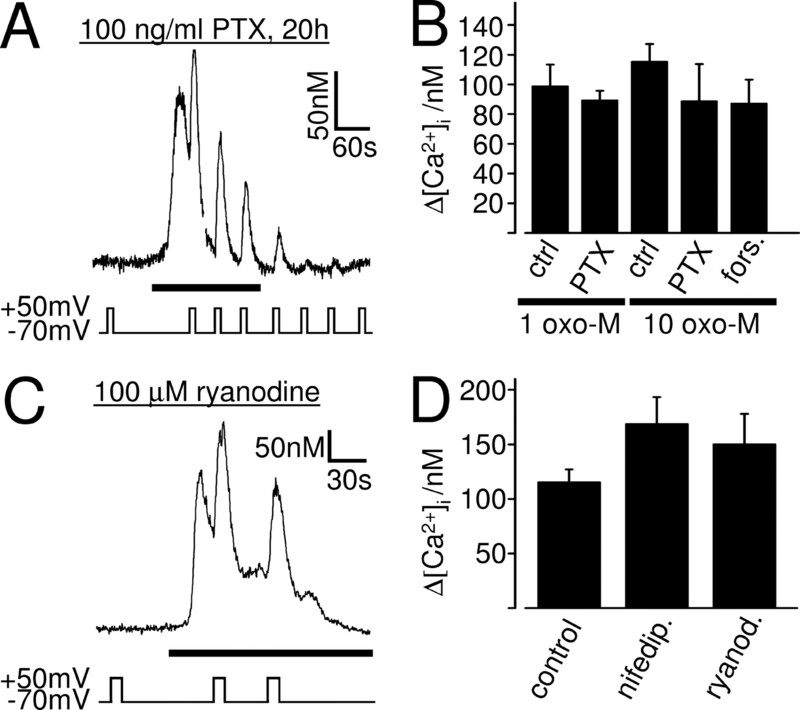 It has been suggested recently that the activity of Gq-protein-coupled P2Y receptors can be directly modulated by small changes of the extracellular K+ concentration, independent of Ca2+ influx or changes in membrane potential (Pitt et al., 2005). The modulation by extracellular K+ might not be restricted to P2Y receptors but may also occur in other Gq-protein-coupled receptors. Under normal physiological conditions, depolarization increases whereas hyperpolarization decreases the driving force for K+ leaving the cell. Depolarization can thus shift K+ out of the cell and lead to accumulation of extracellular K+, which could modulate the activity of Gq-protein-coupled receptors. The gradual (with no apparent upper limit), non-inactivating, bipolar voltage dependence of the muscarinic Ca2+ signal in SH-SY5Y cells excludes traditional voltage-gated ion channels as primary voltage sensors but fits in with the passive movement of certain ions across the plasma membrane along their electrochemical gradients. We therefore investigated whether the DEP of the muscarinic Ca2+ signal in SH-SY5Y cells was attributable to a shift of K+ out of the cell, leading to extracellular K+ accumulation and potentiation of the M3 receptor activity. SH-SY5Y cells were whole-cell patch-clamped and dialyzed with intracellular solution lacking K+ (replaced by NMDG). The dialysis of K+ from the cytoplasm was confirmed by the disappearance of voltage-gated K+ outward currents several minutes after establishing the whole-cell configuration (Fig. 6B). However, even in the absence of intracellular K+, 10 μm oxotremorine-M evoked a Ca2+ signal that was enhanced by depolarization (n = 6) (Fig. 6D,F), indicating that the DEP of the muscarinic Ca2+ signal is not via extracellular K+ accumulation and modulation of M3 receptors by K+. The DEP of the muscarinic Ca2+ signal is not via an effect of voltage on K+ efflux or NCX. A–C, Current responses of whole-cell patch-clamped SH-SY5Y cells to voltage steps from a holding potential of −70 mV to maximally +50 mV in 10 mV increments. In control solution (A), the cells exhibited transient voltage-gated inward and slowly inactivating voltage-gated outward currents. The outward currents vanished when intracellular potassium was replaced by NMDG (B), indicating that they were mediated by voltage-gated potassium channels, isolating the inward (sodium) current, whereas the inward current vanished when extracellular sodium was replaced by NMDG (C), indicating that they were mediated by voltage-gated sodium channels, isolating the outward (potassium) current. D–F, Ca2+ responses of whole-cell patch-clamped SH-SY5Y cells to 10 μm oxotremorine-M (black bars) in the absence of intracellular potassium (D) or extracellular sodium (E). Depolarization potentiated the muscarinic Ca2+ signal in both conditions. F, Mean ± SEM of the intracellular Ca2+ rise evoked by the first depolarization in 10 μm oxotremorine-M in untreated cells (control), in the absence of extracellular sodium (0 [Na+]o), and in the absence of intracellular potassium (0 [K+]i). In all conditions, depolarization potentiated the muscarinic Ca2+ signal significantly (control, n = 38, p < 0.01; 0 [Na+]o, n = 6, p < 0.01; 0 [K+]I, n = 5, p < 0.01). The depolarization-evoked muscarinic Ca2+ increase was not significantly different in control and in the absence of extracellular Na+ or intracellular K+. The cytoplasmic Ca2+ signal is a balance between Ca2+ increase (i.e., release from intracellular stores and influx from the extracellular space) and Ca2+ removal. In our experimental protocol, the Ca2+ increase evoked by Gq-coupled receptor activation and depolarization is via Ca2+ release from intracellular stores, because the experiments were performed in the absence of extracellular Ca2+, excluding the possibility of Ca2+ influx across the plasma membrane via voltage-, store-, or receptor-operated Ca2+ channels. Cells have a variety of mechanisms to remove Ca2+ ions from the cytoplasm, and effects of voltage on the activity of any of these processes will alter the shape of the Ca2+ transient. We thus set out to investigate whether the DEP of the muscarinic Ca2+ signal is via an effect of voltage on the Ca2+-clearing mechanisms, such as mediated by the Na+–Ca2+ exchanger NCX (Mason et al., 2000). This transporter requires Na+ and Ca2+ ions as substrates and is electrogenic, with depolarization inhibiting the removal of Ca2+ from the cell. To test whether the DEP of the muscarinic receptor-evoked Ca2+ signal is via an effect of voltage on NCX, we repeated the experiments in the absence of extracellular Na+ (confirmed by the disappearance of the fast inward current) (Fig. 6C) to block the transporter, of which there are two isoforms (NCX-1 and NCX-3) in SH-SY5Y cells (Magi et al., 2005). However, depolarization enhanced the Ca2+ signal evoked by 10 μm oxotremorine-M even in the absence of extracellular Na+ and Ca2+, when NCX is blocked (Fig. 6E,F) (n = 7), indicating that the DEP of the muscarinic Ca2+ signal does not require extracellular Na+ and is not via an effect of voltage on NCX. A potential effect of voltage on other Ca2+-clearing mechanisms was excluded using flash photolysis approaches and is discussed below. Many intracellular organelles can serve as Ca2+ stores, such as the sarcoplasmic (SR) and endoplasmic reticulum (ER), the nuclear envelope (which is a physical continuation of the ER), the Golgi body, the mitochondria, an NAADP-sensitive store (proposed to be the lysosome or lysosome-related organelle), and secretory vesicles. Of these organelles, only the SR/ER, the nuclear envelope, and the cis-Golgi contain IP3 receptors and accumulate Ca2+ from the cytoplasm via the thapsigargin-sensitive SERCA [sarco(endo)plasmic reticulum Ca2+ ATPase] pump (Michelangeli et al., 2005). It further appears that the SR/ER, although forming one single continuous tubular network, can be made up of two spatially and functionally distinct Ca2+ stores, one of which is IP3 sensitive, whereas the other one is sensitive to caffeine and ryanodine (Golovina and Blaustein, 1997; Verkhratsky, 2005). In addition, these two stores may also differ in their sensitivity to thapsigargin, with the IP3-sensitive store showing a higher sensitivity to the SERCA inhibitor than the caffeine-sensitive store (Garavito-Aguilar et al., 2004). Whereas virtually all SH-SY5Y cells contain an IP3-sensitive Ca2+ store, which is accessed by muscarinic stimulation, only a very small percentage of SH-SY5Y cells appear to contain a functional caffeine-sensitive Ca2+ store (Riddoch et al., 2005), consistent with the low level of ryanodine receptor expression in these cells (Mackrill et al., 1997). However, the caffeine-sensitive store may act as Ca2+ source after muscarinic stimulation (Riddoch et al., 2005). We therefore investigated the role of the different Ca2+ stores in the DEP of the muscarinic Ca2+ signal and examined whether depolarization recruits Ca2+ from another store (e.g., a caffeine-sensitive store) during the muscarinic-evoked Ca2+ release, thus potentiating the muscarinic Ca2+ signal. Application of 10 mm (n = 10) or 30 mm (n = 4) caffeine, a ryanodine receptor agonist, to whole-cell patch-clamped SH-SY5Y cells in Ca2+-free solution did not evoke a Ca2+ response (Fig. 7A), indicating that these cells do not possess a functional caffeine-sensitive Ca2+ store. 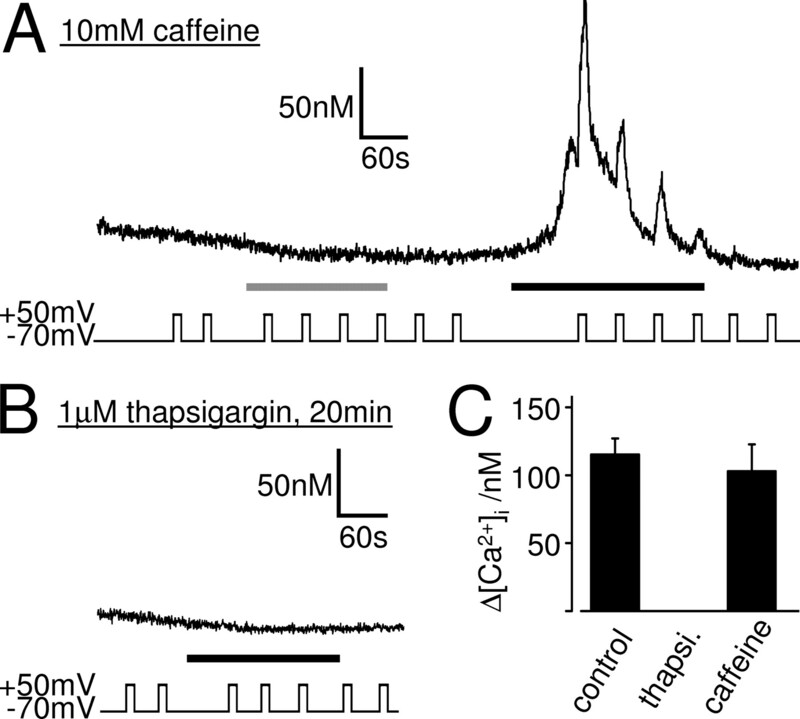 Depolarization from −70 to +50 mV before, during, or after the caffeine application did not affect the intracellular Ca2+ concentration (n = 14). The DEP of the muscarinic Ca2+ signal does require a functional thapsigargin-sensitive Ca2+ store but not a caffeine-sensitive Ca2+ store. Ca2+ responses of whole-cell patch-clamped SH-SY5Y cells to 10 μm oxotremorine-M (black bars) are shown. A, Caffeine at 10 mm (gray bar) failed to evoke a Ca2+ signal, showing that these cells do not contain a functional caffeine-sensitive store. After depletion of any putative caffeine-sensitive store, oxotremorine-M (black bar) evoked a Ca2+ signal that was potentiated by depolarization, indicating that voltage does not recruit Ca2+ from a caffeine-sensitive store. B, Oxotremorine-M failed to evoke Ca2+ responses in cells that were incubated for 20–30 min in 1 μm thapsigargin, to deplete thapsigargin-sensitive Ca2+ stores. Depolarization did not affect the Ca2+ signals in these cells, indicating that a functional thapsigargin-sensitive store is necessary for the effect of voltage. C, Mean ± SEM of the intracellular Ca2+ rise evoked by the first depolarization in 10 μm oxotremorine-M in untreated cells (control), in cells treated with 1 μm thapsigargin (thapsi. ), and in cells pretreated with 10 mm caffeine. Depolarization potentiated the muscarinic Ca2+ signal significantly in control (n = 38; p < 0.01) and after caffeine treatment (n = 7; p < 0.01) but had no effect on the Ca2+ signal when thapsigargin-sensitive stores were depleted. In addition to activating ryanodine receptors, millimolar concentrations of caffeine also block IP3 receptors (Missiaen et al., 1994). We thus removed caffeine from the solutions before eliciting muscarinic Ca2+ responses. Although we could not detect a Ca2+ response to caffeine (see above), all Ca2+ from any putative caffeine-sensitive store should have been released during the 3 min exposure to 10 or 30 mm caffeine. Moreover, the experiments were performed in Ca2+-free solution, ensuring that, once emptied, the Ca2+ stores cannot refill and remain empty for the remainder of the experiment. Even in these conditions, several minutes after caffeine washout, 10 μm oxotremorine-M evoked a Ca2+ response in whole-cell patch-clamped SH-SY5Y cells at −70 mV in Ca2+-free solution, which was potentiated by depolarization (Fig. 7A,C) (n = 7). This shows that (1) the Ca2+ signal evoked by oxotremorine-M is not dependent on a caffeine-sensitive store, and (2) voltage does not recruit Ca2+ from a caffeine-sensitive store during the oxotremorine-M response. The DEP of the muscarinic Ca2+ signal is therefore not via an effect of voltage on Ca2+ release form a caffeine-sensitive store. The thapsigargin-sensitive SERCA pump is located on the SR/ER, the nuclear envelope, and the cis-Golgi but not on mitochondria, lysosomes, or secretory vesicles (Michelangeli et al., 2005). The Ca2+ stores in these organelles can thus be classified as “thapsigargin-sensitive” and “thapsigargin-insensitive” stores. When the SERCA pump is inhibited by thapsigargin, the thapsigargin-sensitive Ca2+ stores rapidly deplete by leakage of Ca2+ out of these stores (Verkhratsky, 2005). To investigate the role of the thapsigargin-sensitive Ca2+ stores in the DEP of the muscarinic Ca2+ signal, we depleted these stores using thapsigargin to see whether depolarization evokes release of Ca2+ from a thapsigargin-insensitive store. After SH-SY5Y cells were incubated for 20–30 min in 1 μm thapsigargin, oxotremorine-M (10 μm; n = 4) failed to evoke a Ca2+ response in whole-cell patch-clamped SH-SY5Y cells at −70 mV in the absence of extracellular Ca2+ (Fig. 7B). This confirms that the muscarinic receptor-evoked Ca2+ response in SH-SY5Y cells is via Ca2+ release from a thapsigargin-sensitive store. More importantly, depolarization before and during the oxotremorine-M application did not affect the intracellular Ca2+ levels (n = 4) (Fig. 7B,C), indicating that depolarization does not evoke release of Ca2+ from a thapsigargin-insensitive store (i.e., from mitochondria, lysosomes, or secretory vesicles) but that a functional thapsigargin-sensitive store is necessary for the DEP of the muscarinic Ca2+ signal. The results above show that the DEP of the muscarinic Ca2+ signal (1) requires a functional thapsigargin-sensitive store and (2) does not involve a caffeine-sensitive store or ryanodine receptors, suggesting that a functional IP3-sensitive store is necessary for the effect of voltage. To investigate whether Ca2+ release from an IP3-sensitive store was sufficient for the DEP of the Ca2+ signal, we activated the IP3-sensitive store directly, without the need for muscarinic stimulation, by photolytic release of caged IP3 or caged GPIP2, the less potent, slowly hydrolysable analog of IP3 (Bird et al., 1992). Uncaging IP3 by a 100 ms UV flash caused a fast rising Ca2+ transient in whole-cell patch-clamped SH-SY5Y cells in Ca2+-free solution at −70 mV (Fig. 8A), which returned to baseline with a half-decay time of 8.1 ± 0.8 s (n = 7). Longer-lasting UV flashes release more caged IP3 and evoked longer-lasting Ca2+ transients (Fig. 8E, white bars). Importantly, none of these Ca2+ responses were affected by depolarization. This is not attributable to the inability to release more Ca2+ at the time of depolarization, because a second UV flash given at that time was always able to evoke additional Ca2+ rise (Fig. 8B) (n = 3, 4, and 4 for two UV flashes of 100 ms, 500 ms, and 1 s duration, respectively). IP3 receptor activation is not sufficient for the effect of voltage on the Ca2+ signal. A–D, Ca2+ responses (F/Fo) of whole-cell patch-clamped SH-SY5Y cells to one (A, C) or two (B, D) 100 ms flashes (arrows) to photolyze caged IP3 (A, B) or GPIP2 (C, D). Depolarization did not affect the IP3 or the GPIP2-evoked Ca2+ signals, showing that IP3 receptor activation is not sufficient for the effect of voltage. E, Mean ± SEM of the half-decay of the Ca2+ response to flash release of caged IP3 (white bars) or GPIP2 (black bars) in relation to the flash duration. Longer flashes generate more IP3/GPIP2, resulting in prolonged IP3 receptor activation and longer-lasting Ca2+ signals (IP3, 100, 500, and 1000 ms, n = 7, 5, and 5, respectively; GPIP2, 100, 500, and 1000 ms, n = 7, 5, and 6, respectively). The GPIP2-evoked Ca2+ responses were significantly longer lasting than the IP3-evoked Ca2+ responses, at all flash lengths (p < 0.01). Because IP3 is rapidly metabolized, the decay of the IP3-evoked Ca2+ transient, during which the effect of voltage was examined, is likely to reflect mainly removal of Ca2+ from the cytoplasm. Thus, if voltage affects IP3 receptor activation, depolarization may fail to alter the decay of the IP3-evoked Ca2+ transient. To investigate the effect of voltage on the Ca2+ transient during IP3 receptor activation, we used caged GPIP2, a slowly metabolized analog of IP3, to activate IP3 receptors continuously. Ca2+ transients evoked by flash photolysis of caged GPIP2 decayed much more slowly than the ones evoked by IP3 (Fig. 8C,E), consistent with sustained activation of IP3 receptors by GPIP2. In addition, longer-lasting flashes produce more GPIP2, leading to continued IP3 receptor activation and longer-lasting Ca2+ responses (Fig. 8E, black bars). Like for IP3, none of the GPIP2-evoked Ca2+ responses were affected by depolarization. Again, this was not attributable to the inability to release more Ca2+ at the time of depolarization, because a second UV flash given at that time was able to evoke an additional Ca2+ rise (Fig. 8D) (n = 5). Whereas Ca2+ removal seems to be a major factor in shaping the IP3-evoked Ca2+ transient, sustained IP3 receptor activation and associated Ca2+ release appear to shape the Ca2+ transient evoked by GPIP2. The observation that none of the IP3- or GPIP2-evoked Ca2+ transients were affected by depolarization suggests that neither Ca2+ removal from the cytoplasm nor Ca2+ release from the IP3-sensitive stores are, under these conditions, sensitive to voltage, in accordance with voltage effects on IP3 receptor signaling in megakaryocytes (Martinez-Pinna et al., 2005). Our data therefore show that (1) Ca2+-clearing mechanisms in SH-SY5Y cells are not affected by depolarization and (2) thapsigargin/IP3-sensitive stores are necessary but not sufficient for the DEP of the muscarinic Ca2+ signal. The voltage sensor of the muscarinic Ca2+ signaling pathway must thus be before the level of the Ca2+ store and resides most likely within the IP3 production pathway itself. To investigate whether the IP3 production pathway itself is indeed sensitive to voltage, we used eGFP–PHPLCδ (Stauffer et al., 1998) to visualize muscarinic receptor-evoked IP3 production. Whereas under basal conditions this biosensor binds to PIP2 and is thus located at the plasma membrane, it translocates to the cytoplasm during production of IP3 and/or depletion of PIP2 (Nahorski et al., 2003), which can be recorded as a cytoplasmic fluorescence increase. In agreement with previous studies in SH-SY5Y cells (Nash et al., 2001), stimulation of muscarinic receptors led to translocation of the biosensor into the cytoplasm (Fig. 9A,B). Depolarization before muscarinic receptor stimulation (control) did not enhance the cytoplasmic fluorescence signal in SH-SY5Y cells transfected with the biosensor (Fig. 9B) (n = 9), indicating that depolarization is not sufficient to trigger a measurable production of IP3/depletion of PIP2. However, the cytoplasmic fluorescent signal evoked by application of 10 μm oxotremorine-M was increased by depolarization to 170 ± 14% (Fig. 9C) (n = 9; p < 0.01), demonstrating that the muscarinic receptor-evoked IP3 production pathway itself is indeed sensitive to voltage per se. Muscarinic IP3 production in SH-SY5Y cells is potentiated by depolarization. A, eGFP–PHPLCδ fluorescence of a whole-cell patch-clamped SH-SY5Y cell. Application of 10 μm oxotremorine-M leads to the production of IP3 and the translocation of the GFP-tagged biosensor into the cytoplasm, which can be seen as an increase in cytoplasmic fluorescence. a–d, The specimen images show the biosensor fluorescence before (a), at the peak (b), and after muscarinic receptor stimulation (d) at −70 mV and during the oxotremorine-M response at +50 mV (c). The image in e is a difference image created by subtracting image a from image b and highlights the increase of cytoplasmic biosensor fluorescence during the peak of the oxotremorine-M response. The dotted line shows the position of the cell. B, The cytoplasmic fluorescence signal (F/Fo) was measured in the whole-cell patch-clamped SH-SY5Y cell shown in A for the duration of the experiment. The arrows indicate the times at which the images displayed in A were chosen. Oxotremorine-M at 10 μm (black bar) evoked an increase in cytoplasmic eGFP–PHPLCδ fluorescence that was potentiated by depolarization. In contrast, depolarization before the muscarinic response did not affect the fluorescence signal. C, Mean ± SEM of the eGFP–PHPLCδ fluorescence response (F/Fo) to 10 μm oxotremorine-M at the time of depolarization, normalized to the fluorescence response without depolarization. Depolarization (10 s from −70 to +50 mV) significantly potentiated the fluorescence response in all cells tested (n = 9; p < 0.01). We also investigated the voltage sensitivity of the IP3 production pathway in cerebellar granule neurons, which endogenously express functional Gq-coupled muscarinic M3 receptors (Whitham et al., 1991). Cultured granule cells (Fig. 10A) were transfected with eGFP–PHPLCδ and perforated patch clamped to control the membrane voltage. Application of oxotremorine-M caused a translocation of the biosensor from the membrane to the cytoplasm (Fig. 10A,B), indicating increased IP3 production/PIP2 depletion. Depolarization before muscarinic receptor stimulation did not affect the cytoplasmic fluorescence signal in granule neurons (Fig. 10B) (n = 5), indicating that depolarization is not sufficient to trigger a measurable production of IP3. However, depolarization during the muscarinic receptor response increased the cytoplasmic fluorescence to 163 ± 11% (n = 5; p < 0.01) (Fig. 10C), indicating substantial voltage sensitivity of the IP3 production pathway in these primary neurons. Depolarization potentiates the muscarinic IP3 production in cerebellar granule neurons. A, DIC image of a perforated patch-clamped cerebellar granule neuron and its eGFP–PHPLCδ fluorescence before (a) and at the peak (b) of the oxotremorine-M-evoked muscarinic response at −70 mV. Note that no fluorescence increases were observed in the large portion of the cytoplasm that is occupied by the nucleus. The image in c is a difference image created by subtracting image a from image b and highlights the increase of cytoplasmic biosensor fluorescence during the peak of the oxotremorine-M response. The dotted lines show the position of the cells. B, The cytoplasmic fluorescence signal (F/Fo) was measured in the perforated patch-clamped cerebellar granule neuron shown in A for the duration of the experiment. The arrows indicate the times at which the images displayed in A were chosen. 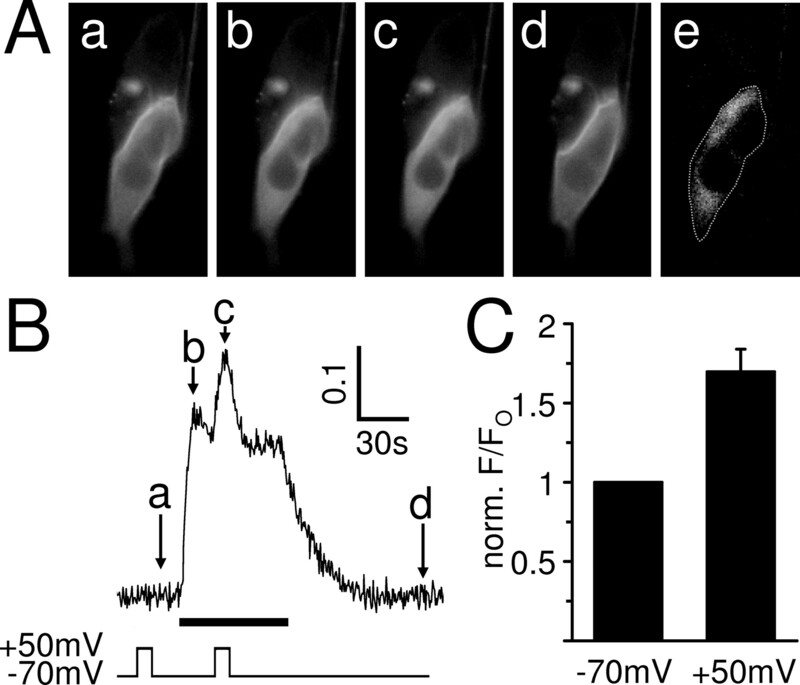 Oxotremorine-M at 10 μm (black bar) evoked an increase in cytoplasmic eGFP–PHPLCδ fluorescence that was potentiated by depolarization, demonstrating that muscarinic IP3 production in these neurons is voltage sensitive. In contrast, depolarization before the muscarinic response did not affect the fluorescence signal. C, Mean ± SEM of the eGFP–PHPLCδ fluorescence response (F/Fo) to 10 μm oxotremorine-M at the time of depolarization, normalized to the fluorescence response without depolarization. Depolarization (10 s from −70 to +50 mV) significantly potentiated the fluorescence response in all cells tested (n = 5; p < 0.01). 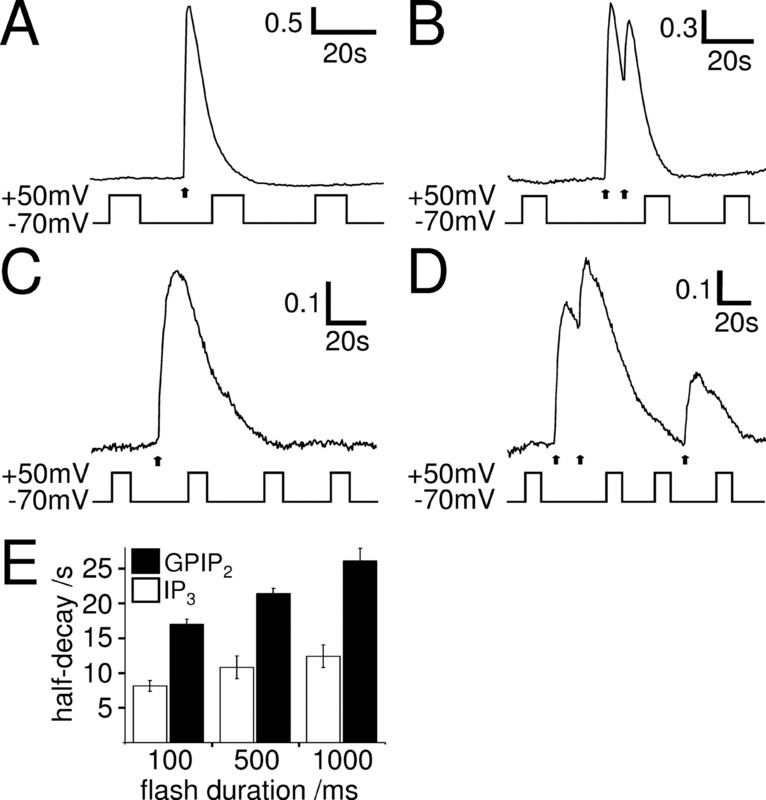 Our results demonstrate that Gq-protein-coupled receptor signaling in neurons is directly sensitive to changes in membrane potential at the level of the IP3 production pathway. Depolarization has a bidirectional effect on GqPCR signaling, potentiating Ca2+ responses to muscarinic receptor activation but attenuating those mediated by bradykinin receptors. These effects represent a mechanism by which the electrical activity of the cell can directly shape GqPCR-mediated IP3 and Ca2+ signaling and thus provide a means for coincidence detection of ionotropic and metabotropic signals. The voltage effects on GqPCR signaling were observed in rat cerebellar granule neurons and the human neuronal cell line SH-SY5Y. Cerebellar granule neurons are the most numerous neurons in the brain and are thought to play an important role in motor learning (Marr, 1969). The cerebellar cortex is innervated by cholinergic fibers, which project mainly to the granule cell layer of the vestibulo-cerebellum (Ojima et al., 1989; Jaarsma et al., 1997), but the functional significance of this is not well understood. Cerebellar granule cells in situ and in vitro endogenously express functional Gq-coupled muscarinic receptors, almost exclusively of the M3 subtype (Whitham et al., 1991; Tice et al., 1996; Takayasu et al., 2003). Alternatively, data were also obtained from SH-SY5Y cells. These cells closely resemble human sympathetic ganglion cells (Ross et al., 1983) and endogenously express a variety of ion channels (Fig. 6) (Forsythe et al., 1992), transporters (Magi et al., 2005), and certain GPCRs, including muscarinic M3 receptors (Lambert et al., 1989; Willars and Nahorski, 1995). Like other neurons, they express the same complement of IP3 receptor (type I), ryanodine receptor (type 2), and SERCA pump (SERCA-2B) (Mackrill et al., 1997; Bollimuntha et al., 2005) isoforms that prevail in the brain (Verkhratsky, 2005) and are thus a good model system to investigate the modulation of neuronal IP3 and Ca2+ signaling. In contrast to these neuronal cells, agonist stimulation of HEK and CHO cell lines stably expressing recombinant muscarinic M3 receptors produced intracellular Ca2+ signals that were not potentiated by voltage, indicating that muscarinic Ca2+ signaling is not necessarily voltage sensitive but requires a neuronal cell background or endogenous expression of other components of the signaling pathway. The precise mechanism of the DEP of the muscarinic signaling in neuronal cells has yet to be determined, but it can be narrowed down to an effect of voltage on the IP3 production pathway itself. In support of this, caged release of IP3/GPIP2 produces Ca2+ responses that are insensitive to depolarization, placing the voltage sensor before the level of the Ca2+ store. Furthermore, experiments using the IP3/PIP2 biosensor eGFP–PHPLCδ directly demonstrate that the IP3 production pathway itself is sensitive to voltage. Other potential mechanisms have also been ruled out, including (1) an effect of voltage on Ca2+ clearing mechanisms and (2) a conformation-coupling model involving L-type voltage-gated Ca2+ channels and ryanodine receptors. Moreover, the DEP has no apparent upper limit, is graded, bipolar, and non-inactivating, excluding traditional voltage-gated ion channels as the primary voltage sensors. PTX, forskolin, IBMX, and K+ substitution experiments have shown that the DEP is not via an effect of voltage on the Gi/o or Gs pathway and subsequent cross talk of these with the Gq pathway (Werry et al., 2003) or via an effect of voltage on K+ efflux, which could locally accumulate and enhance GqPCR signaling (Pitt et al., 2005). The components of the basic GqPCR IP3 production pathway are located in or associated with the plasma membrane, making them potentially susceptible to changes in membrane potential: (1) the GqPCR itself is a heptahelical transmembrane protein (Pierce et al., 2002), (2) the α-subunit of the heterotrimeric Gq-protein is linked to the plasma membrane via palmitoylation (Wedegaertner et al., 1995), (3) PLCβ is loosely attached to the plasma membrane via its PH domain and C-terminal basic amino acids (Rhee, 2001), and (4) PIP2, the substrate of PLCβ, is a highly negatively charged membrane lipid in the inner leaflet of the plasma membrane (McLaughlin et al., 2002). Although our data show that the IP3 production pathway is modulated by voltage, they suggest that this effect is downstream of the GqPCR, for the following reasons. Both maximal and submaximal concentrations of agonist produced Ca2+ responses in SH-SY5Y cells that were potentiated by depolarization, demonstrating that the voltage effects are not attributable to changes in agonist binding as has been suggested previously for the muscarinic response in acinar cells isolated from rat lacrimal glands (Marty and Tan, 1989). This, together with our findings that muscarinic Ca2+ signals in CHO–m3 and HEK–m3 cell lines were not potentiated by voltage, indicates that the action of voltage on the signaling cascade is downstream of the muscarinic GqPCR and does not reside within the receptor. This is in agreement with the voltage effect on muscarinic Ca2+ signaling in guinea pig coronary smooth muscle (Ganitkevich and Isenberg, 1993) but in contrast to the effects on Ca2+ signaling via the P2Y receptor in rat megakaryocytes (Martinez-Pinna et al., 2005) and the signaling mediated by muscarinic M1/M2 and metabotropic glutamate 1/3 receptors recombinantly expressed in Xenopus oocytes (Ben-Chaim et al., 2003; Ohana et al., 2006). Our data thus complement these studies and demonstrate an alternative mechanism by which voltage is able to influence GqPCR signaling. It is unclear at present which component of the IP3 production pathway downstream of the GqPCR is voltage sensitive. One possibility is that the activity of PLCβ can be affected by voltage, such that the rate of PIP2 hydrolysis, and hence IP3 production, increases when the cell is depolarized. Although depolarization has been shown to indirectly affect the activity of PLCβ, by means of Ca2+ influx through voltage-gated ion channels and positive modulation of PLCβ (Hashimotodani et al., 2005), this cannot account for our results, because (1) all of our experiments were performed in the absence of extracellular Ca2+, (2) no increase in cytoplasmic Ca2+ was observed when the cells were depolarized in the absence of muscarinic agonist, and (3) the activation/inactivation profile of the DEP did not agree with a traditional voltage-gated ion channel as the primary voltage sensor. We also found that depolarization has a bidirectional effect, even in the same cell, potentiating the Ca2+ signal produced by muscarinic receptor activation but attenuating that produced by bradykinin receptor activation, although both receptors couple to the Gq–PLCβ–IP3 pathway. 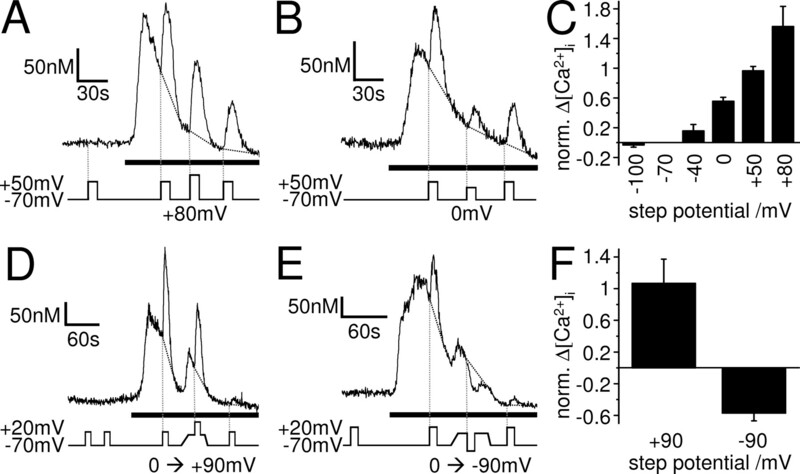 The differential effects of voltage on the bradykinin and the muscarinic Ca2+ signals may be attributable to their ability to activate different PLCβ isoforms (Haley et al., 2000), some of which may be sensitive to voltage whereas others may not. Another possibility is that the availability of the PLCβ substrate PIP2 is affected by voltage, and, at least in rat superior cervical ganglion neurons, muscarinic and bradykinin receptors appear to have different signaling microdomains (Delmas and Brown, 2002), possibly containing separate PLC isoforms and pools of PIP2. Interestingly, the presence of a voltage-sensing domain in a PIP2-producing enzyme Ci-VSP has been found recently in ascidian Ciona intestinalis sperm tails (Murata et al., 2005), demonstrating a possible link between membrane voltage and PIP2 availability. The observation that muscarinic IP3 and Ca2+ signaling in neurons is directly sensitive to voltage could have considerable implications for neuronal function. It directly links the electrical activity of neurons to muscarinic signaling and may provide a fundamental mechanism by which ionotropic signals can shape metabotropic activity, thus opening a gateway to coincidence detection of ionotropic and metabotropic signaling. Interestingly, ionotropic and metabotropic signaling has been shown to synergize and increase IP3 production and Ca2+ store release in a variety of neuronal preparations (Nakamura et al., 1999, 2000, 2002; Okubo et al., 2001, 2004; Larkum et al., 2003; Nash et al., 2004; Young et al., 2004, 2005). However, this synergism is thought to be attributable to Ca2+ entry via ionotropic and voltage-gated ion channels, leading to (1) increased store filling (Irving and Collingridge, 1998; Rae et al., 2000), (2) sensitization of the IP3 receptor (Berridge, 1998; Nakamura et al., 1999), and (3) positive feedback onto PLCβ (Eberhard and Holz, 1988; Nash et al., 2004; Hashimotodani et al., 2005). Our results suggest an additional mechanism of synergism in which the ionotropic receptor-evoked depolarization itself, without the need of Ca2+ influx, may be able to increase IP3 production and thus Ca2+ release from intracellular stores in neurons. The DEP of muscarinic signaling could be important in a variety of physiological and pathological conditions. For example, muscarinic signaling in neurons can influence a variety of ion channels, thus modulating neuronal excitability (Brown et al., 1997; Suh and Hille, 2005). In the hippocampus, this results in cholinergic activation generally depolarizing neurons and increasing action potential discharge (Cobb and Davies, 2005; Young et al., 2005), and, in the cerebellum, the activation of muscarinic M3 receptors leads to the depolarization of granule neurons and increases the frequency of spontaneous synaptic events onto Purkinje cells (Takayasu et al., 2003). Our data imply that the muscarinic-evoked depolarization could form a positive feedback onto the muscarinic signal, enhancing its actions further. Muscarinic signaling has also been shown to play a pivotal role in the enhancement of endocannabinoid release and thus depolarization-induced suppression of inhibition (DSI), via postsynaptic muscarinic receptors (Ohno-Shosaku et al., 2003). Interestingly, the enhancement of DSI is facilitated when muscarinic activation is combined with depolarization, an effect attributed to Ca2+ influx through voltage-gated Ca2+ channels and positive modulation of PLCβ by Ca2+ (Hashimotodani et al., 2005). Our results provide an additional mechanism in which depolarization per se enhances the muscarinic signaling pathway, thus contributing to the coincidence detection of muscarinic receptor activation and depolarization. The effect of voltage on GqPCR signaling thus adds yet another layer of complexity to the neuronal signaling mechanisms mediated by these receptors. This work was supported by Wellcome Trust Programme Grant 062495 (S.R.N., R.A.J.C.) and Project Grant 071244 (B.B.). D.B. holds a Wellcome Trust Value-In-People Fellowship, and B.B. is a Royal Society University Research Fellow. We thank Prof. Ian Forsythe for loan of equipment, Dr. David Ogden for technical advice, and Drs. Ken Young and Fay Heblich for advice on neuronal transfection. (2003) Dihydropyridine receptors as voltage sensors for a depolarization-evoked, IP3R-mediated, slow calcium signal in skeletal muscle cells. J Gen Physiol 121:3–16. (2003) Local calcium signaling in neurons. Neuron 40:331–346. (2003) The M2 muscarinic G-protein-coupled receptor is voltage-sensitive. J Biol Chem 278:22482–22491. (1993) Inositol trisphosphate and calcium signalling. Nature 361:315–325. (1992) Sustained Ca2+ signaling in mouse lacrimal acinar cells due to photolysis of “caged” glycerophosphoryl-myo-inositol 4,5-bisphosphate. J Biol Chem 267:17722–17725. (2005) TRPC1-mediated inhibition of 1-methyl-4-phenylpyridinium ion neurotoxicity in human SH-SY5Y neuroblastoma cells. J Biol Chem 280:2132–2140. (1997) Muscarinic mechanisms in nerve cells. Life Sci 60:1137–1144. (2005) Cholinergic modulation of hippocampal cells and circuits. J Physiol (Lond) 562:81–88. (1996) δ- and μ-opioid receptor mobilization of intracellular calcium in SH-SY5Y human neuroblastoma cells. Br J Pharmacol 117:333–340. (1998) Regulation of adenylyl cyclase by membrane potential. J Biol Chem 273:27703–27707. 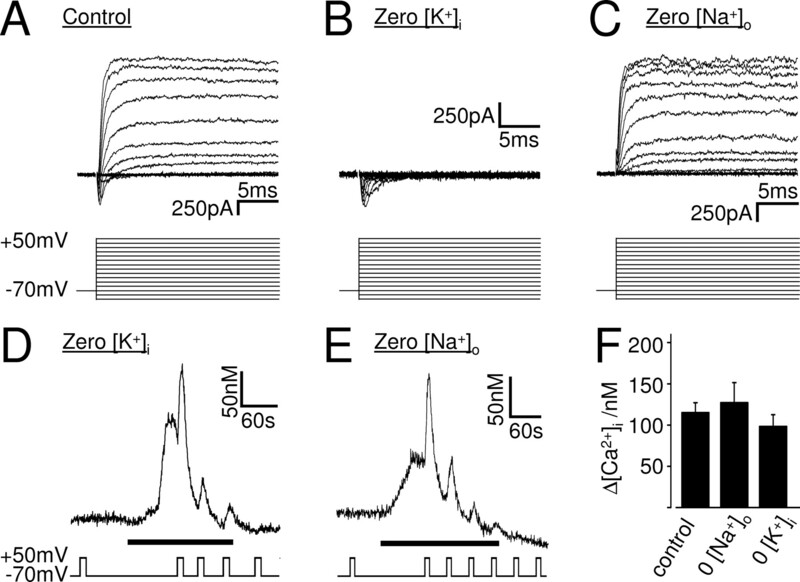 (2004) Ca2+ syntillas, miniature Ca2+ release events in terminals of hypothalamic neurons, are increased in frequency by depolarization in the absence of Ca2+ influx. J Neurosci 24:1226–1235. (2003) Ca2+ channel-sarcoplasmic reticulum coupling: a mechanism of arterial myocyte contraction without Ca2+ influx. EMBO J 22:4337–4345. (2002) Junctional signaling microdomains: bridging the gap between the neuronal cell surface and Ca2+ stores. Neuron 36:787–790. (1988) Intracellular Ca2+ activates phospholipase C. Trends Neurosci 11:517–520. (1992) Elevation of cytosolic calcium by cholinoceptor agonists in SH-SY5Y human neuroblastoma cells: estimation of the contribution of voltage-dependent currents. Br J Pharmacol 107:207–214. (1993) Membrane potential modulates inositol 1,4,5-trisphosphate-mediated Ca2+ transients in guinea-pig coronary myocytes. J Physiol (Lond) 470:35–44. (2004) Differential thapsigargin-sensitivities and interaction of Ca2+ stores in human SH-SY5Y neuroblastoma cells. Brain Res 1011:177–186. (1997) Spatially and functionally distinct Ca2+ stores in sarcoplasmic and endoplasmic reticulum. Science 275:1643–1648. (2000) Bradykinin, but not muscarinic, inhibition of M-current in rat sympathetic ganglion neurons involves phospholipase C-β4. J Neurosci 20(RC105):1–5. (2005) Phospholipase Cβ serves as a coincidence detector through its Ca2+ dependency for triggering retrograde endocannabinoid signal. Neuron 45:257–268. (1998) A characterization of muscarinic receptor-mediated intracellular Ca2+ mobilization in cultured rat hippocampal neurones. J Physiol (Lond) 511:747–759. (1997) Cholinergic innervation and receptors in the cerebellum. Prog Brain Res 114:67–96. (1987) Differential expression of α-subunits of G-proteins in human neuroblastoma-derived cell clones. FEBS Lett 224:43–48. (1989) Muscarinic receptor binding characteristics of a human neuroblastoma SK-N-SH and its clones SH-SY5Y and SH-EP1. Eur J Pharmacol 165:71–77. (2003) Synaptically activated Ca2+ waves in layer 2/3 and layer 5 rat neocortical pyramidal neurons. J Physiol (Lond) 549:471–488. (1997) Differential expression and regulation of ryanodine receptor and myo-inositol 1,4,5-trisphosphate receptor Ca2+ release channels in mammalian tissues and cell lines. Biochem J 327:251–258. (2005) Involvement of Na+-Ca2+ exchanger in intracellular Ca2+ increase and neuronal injury induced by polychlorinated biphenyls in human neuroblastoma SH-SY5Y Cells. J Pharmacol Exp Ther 315:291–296. (1999) Depolarization-evoked Ca2+ release in a non-excitable cell, the rat megakaryocyte. J Physiol (Lond) 515:385–390. (1969) A theory of cerebellar cortex. J Physiol (Lond) 202:437–470. (2004) Sensitivity limits for voltage control of P2Y receptor-evoked Ca2+ mobilization in the rat megakaryocyte. J Physiol (Lond) 555:61–70. (2005) Direct voltage control of signaling via P2Y1 and other Gαq-coupled receptors. J Biol Chem 280:1490–1498. (1989) The initiation of calcium release following muscarinic stimulation in rat lacrimal glands. J Physiol (Lond) 419:665–687. (2001) Voltage-dependent Ca2+ release in rat megakaryocytes requires functional IP3 receptors. J Physiol (Lond) 533:175–183. (2000) A novel role for membrane potential in the modulation of intracellular Ca2+ oscillations in rat megakaryocytes. J Physiol (Lond) 524:437–446. (2002) PIP2 and proteins: interactions, organization, and information flow. Annu Rev Biophys Biomol Struct 31:151–175. (2005) A plethora of interacting organellar Ca2+ stores. Curr Opin Cell Biol 17:135–140. (1994) Inhibition of inositol trisphosphate-induced calcium release by caffeine is prevented by ATP. Biochem J 300:81–84. (2005) Phosphoinositide phosphatase activity coupled to an intrinsic voltage sensor. Nature 435:1239–1243. (2003) Visualizing phosphoinositide signalling in single neurons gets a green light. Trends Neurosci 26:444–452. 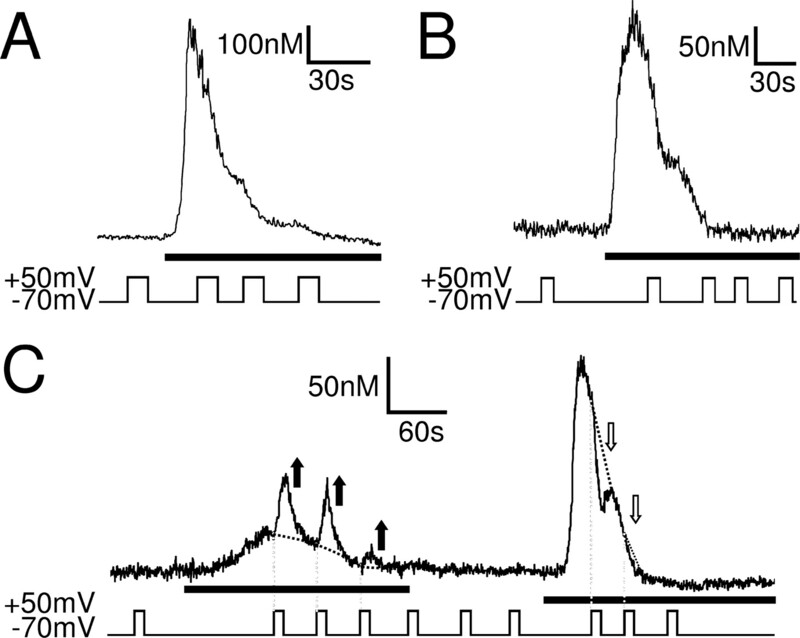 (1999) Synergistic release of Ca2+ from IP3-sensitive stores evoked by synaptic activation of mGluRs paired with backpropagating action potentials. Neuron 24:727–737. (2000) Inositol 1,4,5-trisphosphate (IP3)-mediated Ca2+ release evoked by metabotropic agonists and backpropagating action potentials in hippocampal CA1 pyramidal neurons. J Neurosci 20:8365–8376. (2002) Spatial segregation and interaction of calcium signalling mechanisms in rat hippocampal CA1 pyramidal neurons. J Physiol (Lond) 543:465–480. (2001) Single-cell imaging of graded Ins(1,4,5)P3 production following G-protein-coupled-receptor activation. Biochem J 356:137–142. (2004) Synaptic activity augments muscarinic acetylcholine receptor-stimulated inositol 1,4,5-trisphosphate production to facilitate Ca2+ release in hippocampal neurons. J Biol Chem 279:49036–49044. (2002) G protein pathways. Science 296:1636–1639. (2006) The metabotropic glutamate G-protein-coupled receptors mGluR3 and mGluR1a are voltage sensitive. J Biol Chem 281:24204–24215. (2003) Postsynaptic M1 and M3 receptors are responsible for the muscarinic enhancement of retrograde endocannabinoid signalling in the hippocampus. Eur J Neurosci 18:109–116. (1989) Cholinergic innervation of the rat cerebellum: qualitative and quantitative analyses of elements immunoreactive to a monoclonal antibody against choline acetyltransferase. J Comp Neurol 290:41–52. (2001) Visualization of IP3 dynamics reveals a novel AMPA receptor-triggered IP3 production pathway mediated by voltage-dependent Ca2+ influx in Purkinje cells. Neuron 32:113–122. (2004) Cross talk between metabotropic and ionotropic glutamate receptor-mediated signaling in parallel fiber-induced inositol 1,4,5-trisphosphate production in cerebellar Purkinje cells. J Neurosci 24:9513–9520. (2002) Seven-transmembrane receptors. Nat Rev Mol Cell Biol 3:639–650. (2005) Potentiation of P2Y receptors by physiological elevations of extracellular K+ via a mechanism independent of Ca2+ influx. Mol Pharmacol 67:1705–1713. (2000) Role of Ca2+ stores in metabotropic l-glutamate receptor-mediated supralinear Ca2+ signaling in rat hippocampal neurons. J Neurosci 20:8628–8636. (1995) Voltage-sensitive adenylyl cyclase activity in cultured neurons. A calcium-independent phenomenon. J Biol Chem 270:14340–14346. (2001) Regulation of phosphoinositide-specific phospholipase C. Annu Rev Biochem 70:281–312. (2005) Release and sequestration of Ca2+ by a caffeine- and ryanodine-sensitive store in a sub-population of human SH-SY5Y neuroblastoma cells. Cell Calcium 38:111–120. (1983) Coordinate morphological and biochemical interconversion of human neuroblastoma cells. J Natl Cancer Inst 71:741–747. (1998) Receptor-induced transient reduction in plasma membrane PtdIns(4,5)P2 concentration monitored in living cells. Curr Biol 8:343–346. (2005) Regulation of ion channels by phosphatidylinositol 4,5-bisphosphate. Curr Opin Neurobiol 15:370–378. (2003) Muscarine-induced increase in frequency of spontaneous EPSCs in Purkinje cells in the vestibulo-cerebellum of the rat. J Neurosci 23:6200–6208. (1996) Distribution of muscarinic receptor subtypes in rat brain from postnatal to old age. Brain Res Dev Brain Res 92:70–76. (2004) Single-cell imaging of intracellular Ca2+ and phospholipase C activity reveals that RGS 2, 3, and 4 differentially regulate signaling via the Gαq/11-linked muscarinic M3 receptor. Mol Pharmacol 66:1453–1464. (1995) Lipid modifications of trimeric G proteins. J Biol Chem 270:503–506. (2003) Mechanisms of cross-talk between G-protein-coupled receptors resulting in enhanced release of intracellular Ca2+. Biochem J 374:281–296. (1991) M3 muscarinic cholinoceptors are linked to phosphoinositide metabolism in rat cerebellar granule cells. Eur J Pharmacol 206:181–189. (1995) Heterologous desensitization of both phosphoinositide and Ca2+ signaling in SH-SY5Y neuroblastoma cells: a role for intracellular Ca2+ store depletion? Mol Pharmacol 47:509–516. (1998) Phosphorylation of inositol 1,4,5-trisphosphate receptors by cAMP-dependent protein kinase. Type I, II, and III receptors are differentially susceptible to phosphorylation and are phosphorylated in intact cells. J Biol Chem 273:5670–5677. (2004) NMDA-receptor regulation of muscarinic-receptor stimulated inositol 1,4,5-trisphosphate production and protein kinase C activation in single cerebellar granule neurons. J Neurochem 89:1537–1546. (2005) Muscarinic acetylcholine receptor activation enhances hippocampal neuron excitability and potentiates synaptically evoked Ca2+ signals via phosphatidylinositol 4,5-bisphosphate depletion. Mol Cell Neurosci 30:48–57.